Travel with Kevin and Ruth! 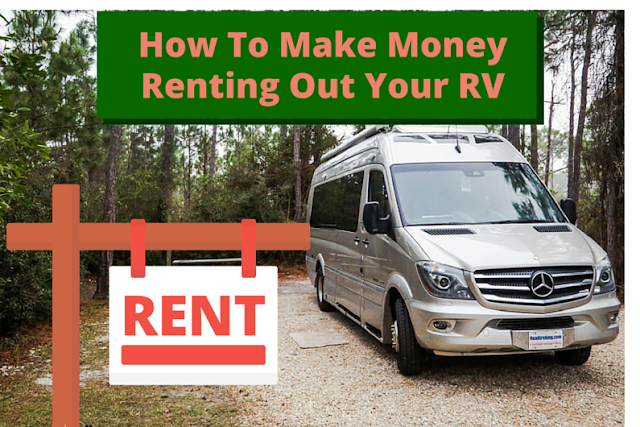 : Rent out your RV...? I've always thought this was a great idea. I mean, if your RV is just sitting there while you're not using it, why not make some money from it. The RV rental business is booming. Especially at this time of year. Rental companies can't keep up with the number of requests they're getting. And the average RV owner only uses their RV for about three weeks of the year. Put those two factors together and you've got a great business plan. The sharing economy continues to grow. Now, you can easily share your RV, and the person you are sharing with helps you to pay for it! Interestingly, the main concern that people had was with regards to damage. But anything damaged can be fixed. And of course the renter leaves a damage deposit for minor items, and your rig is fully covered under RV Share's insurance for anything major. So damage isn't an issue. Is there going to be some wear and tear on your rig? Of course. But you're getting paid for that as part of the daily rental fee that you collect. RV Share is only available to RVs registered in the United States. But, we haven't forgotten about our Canadian readers. You can also rent out your RV up here in the great white north. RVezy is a new online site that enables Canadian RV owners to make money from their investment. Again, your unit is fully insured, and it doesn't cost you a dime. In fact, I've even thought of buying an RV specifically to rent out. I think it's a great idea if your RV sits doing nothing for any period of time. Rv's rent for anywhere from $100 to $350 a day and more if you have an expensive unit. A week's rental of an average unit could easily bring in $1,000. I'm told that small motorhomes are the most popular, and so they are in the highest demand. But you can even rent out your travel trailer that's permanently parked as a seasonal at a campground. And why wouldn't you? Check it out. Do some reading of their FAQ section, and decide for yourself. You could have a regular monthly income from your underused RV. I had an old travel trailer and I used it as a B&B in my neighborhood. I geared it to working people coming into the area for meetings. And traveling nurses. I have thought of this often and we even offered to rent it to friends once but they decided not to. I suspect they wanted it for free :). We rented an old beat-up 24 foot MH once for a long weekend at the lake and paid $80 per day. It was in pretty rough shape with no water pump and leaking propane. He said he normally got $100 per day. I know the established rental companies like Cruise Canada get over $350 per day for the larger units. Yes, in answer to your question, I would consider renting ours out. Yikes, $80 a day for a beat up one that doesn't have working water pump and leaking propane! Imagine what you could get for a decent one like yours. As you said, we would consider it too, rather than just letting it sit around. Definitely something to think about that is for sure. Not renting ours out mainly because we live it it full-time. I have in the past loaned/rented a couple but of previous rvs, always things happened and they were not willing to do the costly repairs. Did you not have insurance and a security deposit...? No that was my fault, but that was years ago. We happened to talk about this over the weekend. An rver who winters in Mazatlan, has a group-owned motorhome located in Europe and rents it out. I believe its worth the money. Our current TT costs us next to nothing for use, maintenance and upkeep but we can't drag it around South America or Europe. We decided it would be a good deal versus buying a motorhome. I just can't justify 150K or more but we're not rich people either. Let's say you spend $5000 on renting for say two yearly trips, that would give you 30 years of renting not including interest earned on the amount, no maintenance, insurance or upkeep. All that is included in the rental. We are looking to rent a Class B at the moment for sometime this summer. True, that is one way to look at renting over buying but you also don't have to spend $150K or more on a unit either. I think it would be cheaper than renting from commercial renters...they charge by the mile. Yes, it would be cheaper than renting from commercial companies but then you would also get a big variety of units and very possibly some older ones rather than newer ones. Never ever again. When we bought our very first RV we rented it out to one of Canadian RV companies in Vancouver. It was trashed the first time out and it was brand new, we had never even slept in it. At the time we were too busy to take much time off so we thought renting it would be a good way to pay the loan we took out to buy it. The rent company did do all the repairs. Next we started to rent it to a movie company that used it on movie sets for the various high end movie stars and it was not really heavily used. At one time we had Bridget Fonda in it for a new months. Then Tom Green had it for a few weeks and trashed it again. Bleach spilled on the carpet and for some reason canned soda had been shaken and spewed over the walls, curtains and upholstery. It took over a month for them to do the repairs and we barely got it in time for our 2 week vacation over Christmas. So never ever again. Just not worth the money we could make on it. And I gotta ask... where did you go for a two week vacation from Vancouver in an RV over Christmas... ? We got the first RV in 1999. The current RV was purchased in 2001 and it has never ever been rented out nor will be. I'm with Contessa. We never even lend our to family. It's our and I feel no one will take care of it like we do. Think people who rent would not take care of it like the owners would. Our is 10 years old and someone asked us this year was it new. It's well looked after by us. You and Contessa are with the majority of RV'ers because most wouldn't want to rent it out and we totally understand. I know it was a difficult decision for us to do the motorhome exchange last year but in that case Tana and Graham knew that we also would be using their motorhome and would want us to treat it as our own and we hoped they would do with ours which they did and it all worked out. Anyways, it is an option to think about for some people who would being willing to consider it, especially if they had a unit that was being underused. We would consider it but not sure that we would actually do it or not, at least with Sherman. We will see how we feel about it down the road. True, but having an older unit may be a little easier on the nerves than a new one. I think that we might not consider renting a newer unit out but it also helps that we have done a motorhome exchange so that we have gotten past that lending it out to someone we don't know issue. It could be a possibility next year when we have Sherman here at the park with us. They say it is better to use an RV than to just let it sit for months on end. My neighbor across the street started out renting his class C, now owns a couple of TTs that he rents, and just bought a new Sprinter based C to rent. He asked if I was interested in renting mine (93 30' comparable to Sherman). I don't rent it, because it doesn't cost me anything (paid for and parked on my property). If I was making monthly payments and renting storage space, I'd consider it. Sounds like your friend has a nice little "business" going for himself. Maybe he is working on getting a bigger unit for his retirement by renting out these units. Glad to see we aren't the only ones that would consider it!